Traditional Watchmaker Fossil Adds NFC Payments, Heart Monitor to Smartwatch Line, as It Seeks to Reverse Earnings Slump | NFC Times – Near Field Communication and all contactless technology. Troubled traditional watchmaker Fossil hopes to reverse its fortunes in part with NFC payments. Two new Fossil watches, unveiled this week, the Q Venture HR and Q Explorist HR, are part of Fossil’s fourth-generation smartwatch Q line, which the large traditional watchmaker hopes will help in part to offset a three-year financial slump. Both new watches will support Google’s Wear OS and also NFC with “exclusive compatibility with Google Pay.” Other models of Fossil smartwatches are expected to support NFC, as well. 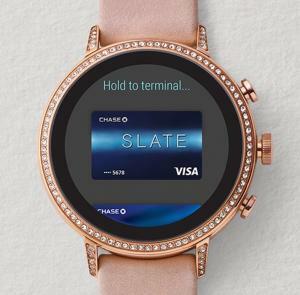 Fossil, in its announcement of the new watches, said the Google Pay function would support both transit ticketing and (retail) payments, although it’s not clear if the watches would support closed-loop transit payments applications. If not, users could tap the watches to ride only if transit operators support payment of fares by open-loop credit and debit cards.